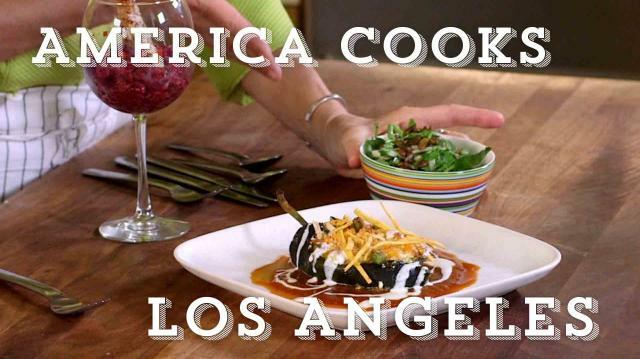 Take a trip to sunny L.A. and watch contestant Vinita Lark Williams and celebrity chef Mary Sue Milliken (Border Grill) spice up the kitchen with this healthy take on a Mexican classic. Big on flavor and veggies, but low on calories and super satisfying. 2 cups butternut squash, peeled and diced ½”1 onion, peeled and diced 1/4"
Optional garnish (if calorie count is not too high),2 Tbsp. plain yogurt (full fat) for drizzling over hot chile before the tortilla strips. Roast peppers over an open flame or under the broiler until skin is charred black, but the flesh is not cooked soft.Place in a paper bag to cool.When cool enough to handle, rub the charred skin off the peppers and on 4 of the poblanos cut a slit and carefully remove the seeds, ribs and core - leaving the stem intact.Take the remaining poblano and the 2 bell peppers, remove the stems and seeds and cut into 1/2" dice. Bring a pot of well salted water to a boil and add the diced butternut squash, when just tender drain and place cooked squash in a single layer on a plate or cookie sheet to cool. In a skillet, heat the olive oil over medium heat and add the diced onion with salt and freshly ground black pepper.Cook until slightly golden brown, about 10-12 minutes, then add the garbanzos, squash and diced poblano and bell peppers.Cook together 5 minutes over medium heat stirring and tossing to combine well.Remove from heat and place in a bowl, add 1/2 cup each of the grated cheeses and mix well to combine.Taste and adjust seasoning. Place the 4 whole poblano chilies in a casserole and divide the stuffing between them.Sprinkle the remaining 1/2 Tbsp. of each cheese over the filling in the pepper's opening. Bake at 350 degrees for 20-25 minutes or until the filling is piping hot and the cheeses on top are golden brown. On each plate, place a 1/4 cup chipotle salsa to one side, then place hot poblano in the center of the salsa, drizzle with the yogurt and top with crispy baked tortilla strips.Serve immediately with watercress jicama salad alongside the relleno. Place all ingredients in a small pot, bring to a boil, reduce to a simmer and cook gently 20-30 minutes.Puree in blender and reserve for serving chilerellenos. Preheat oven to 350 degrees. Mix oil lime juice slat and paprika together in a small bowl and stir until salt is dissolved.Place tortilla on countertop and brush this mixture onto the tortilla both sides, coating evenly.Slice tortilla into 2" strips and then slice those strips into very thin (1/16") strips. Spread out in a single layer on a non-stick baking sheet (or parchment lined) and bake 7-10 minutes or until crispy.Cool completely and sprinkle over chilerelleno. Thinly slice the jícama and then cut into 1/8-inch-wide strips.Combine the jícama and watercress in a bowl. Whisk together the olive oil, lime juice, white balsamic vinegar, salt and pepper.Pour over the salad and toss well to coat.Serve immediately on chilled plates. For a fuller-bodied salad, fan avocado slices across the top and drizzle with cracked black pepper garnish. Let’s add avocado if we can afford the calories! Mix all of the ingredients, except the pepitas, together in a bowl.Toss and coat pepitas in the mixture.Spread on a baking sheet and bake 5 minutes, or until lightly browned, shaking the pan once or twice. Bring water to a boil with the hibiscus flowers tea.Add agave nectar and simmer for about 3 to 5 minutes. Cool to room temperature and add lemon juice to taste, adjust for sweetness and strain the liquid into baking pans until about 1 inch high.Freeze, scraping up the ice mixture every 30 minutes to form the granita. Spoon about 2 tablespoons of batter for each cookie onto the lined cookie sheet and gently flatten to circles of about 2¼ inches in diameter. (These cookies do not spread. )OR chill this cookie dough and roll chilled dough into straws about 4” x ½”, then place on parchment. Bake 10 minutes or until the coconut turns very pale golden, being careful not to over brown. Transfer to racks to cool.